This practical introduction to linguistics is a must-have resource for all speech and language therapy students, providing you with the fundamental theory needed as a foundation for practice. Written by authors with extensive experience in both research and teaching, Introductory Linguistics for Speech and Language Practice equips you with a practical understanding of relevant linguistic concepts in the key language areas of morphology, syntax, semantics, discourse and pragmatics. Each chapter opens by explaining why the information is of relevance to the speech language therapist, and this integrated approach is emphasised via reference to relevant clinical resources. Exercises throughout each chapter also allow you to test your understanding of key principles and apply this knowledge to other areas of your study. 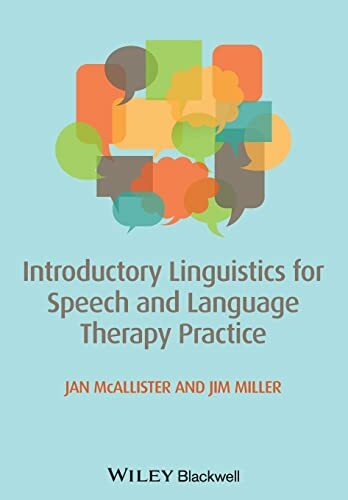 This concise, readable guide is a core text for all undergraduate and postgraduate students of speech and language therapy, and is also ideal for qualified therapists wanting to enrich their understanding of the linguistic assessments they use in practice. McAllister, Jan; Miller, James E.